Pentax DA 15mm f/4.0 limited is surprisingly small. Those who love the pancake will love the DA 15 in terms of size and compactness. The following is a side by side with the 21mm with hood mounted. It offers the minimum focusing distance of 0.18m which is the shortest among all the DA limited primes. It is very likely that it offers the best close up among DA limited but more tests and use cases are needed to confirm. And a visual differentiators is the thin metal screw cap. The inner lining seems like dust magnet as it is made of some cloth material like suede similar to other DA limited lens. The manual focusing is much more dampened than the 21mm. AF is a sweet baby. The close up is at 0.18m in the DA 15 as compared to 0.2m in DA 21. It is too early to draw any conclusions but here are few notes that come to my attentions. The focusing ring is well dampened when I compare it to 21mm limited. Not that I use it in manual focusing but the quick shift focus in DA prime with a dampened focusing ring is a welcome thought. Sharpness is great in center. Yet to see corner sharpness. Handling, size, compactness is good with the 15. Surprisingly good. The lens cap is one of a kind unique among the DA limited. I like its thin cap design and the screw mount cap will take some time to get used to but I think Pentax design it well for the 15mm. Outstanding in flare control in shooting into the light. The 21mm is already quite good in both flare control and protection from the square opening of the lens hood but the 15mm is simply outstanding in flare control. The lens hood in 15 limited is pull-out type and hence it doesn't protect the lens as well as the fixed lens hood on the 21mm limited. The lens hood is of a petal shaped hood. Unlike the 21mm limited, it is much easier to add a filter or a diopter to the lens front as the built in lens hood don't intrude the mounting of a filter. That is not the case in the 21mm where the lens hood is fixed and the only thing one can do is to get a 43mm odd sized filter. And I honestly don't know if a 43mm filter will work well with the built-in lens hood on the 21 limited. On the 15, it is plain and simple just like any front loading lens front and the beauty lies in that the lens hood continues to work for the 15 limited. Just found your blog this week and added you to my feed reader. I've been thinking about ordering a white K-x as my first DSLR and will probably do so this week. Planning on getting the Tamron 70-300 and Pentax 10-17 to go with the kit lens initially. Thanks for the amazing reports on your Pentax gear, it's been invaluable! Eventually, I will be able to reconstruct my equipment bag. @Nathan, be warned about PF/CA in both of the lenses that you are looking, the 10-17 is a fish-eye lens and make sure you are comfortable with the distortions as it is not a lens for common use. 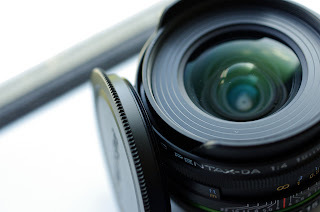 A Pentax DA 15 or DA 21 will be wide angle lens and without the fishy effects of the 10-17. Also, a better alternatives to the Tamron 70-300mm f/4.0-5.6 will be the Pentax DA (or the cheaper DA-L) 55-300mm as it beats the Tamron on PF/CA control. Do seek information before the purchase. @Yvon, that is a bummer. You can't find something equivalent in other brands. Pentax did it right on this uwa. @El Jaco, congratulation on the new lens. I'm debating between getting the DA 15 or DA 21. Do you see yourself using one more than the other? Is there a reason to own both, if I could afford it? If you could only buy one, which one do you recommend? Thanks. @Ron, this is the toughest question that I face in making the purchase after owning the 21mm happily for a long time. More time will tell which one get used more often in my bag. If you don't have either of them, I will suggest to go with 15mm first if your need is very much into an ultra wide angle (uwa) as the 21mm is wide normal and not an ultra wide. In 35mm perspective, the 15mm is like a 24mm and the 21mm is like a 30mm in proximity. I always like 24mm in the FF (or 35mm) film world. So it is not deal breaker just to get the 15mm for ultra wide need. Should you get both: yes and no and it is subject to your LBA mind and need vs want. If you already have a zoom like 10-20, 12-24, 10-24, don't get two primes as it overlap way too much. Go with 1 zoom and 1 prime. If you don't have any ultra wide zoom, you can justify like Hin to have 15 and 21 to cover the wide angle needs. IMO, the 15mm will serve better than the 21mm as a prime supplement to a normal zoom. For example, a 15mm + 17-70mm in traveling is a God sent combination in traveling wise. But that is not the case with 21mm + 17-70mm as the wide end needs get stuck at 17. Also prime trio combo is better served with 15 as in 15/40/70 vs 21/40/70. My favorite will be 15/35/70 as my 35 get go close up with 1:1 any minute of the date. Thanks, Hin Man! This is so helpful. I'll plan to skip the 21mm for now and save my money for either the 35 or 70 as my NEXT LBA lens after the DA15! Awesome, you have what seems to be the World Cup on your TV in the last shot! @Somanna, I was seeing World Cup on Saturday. And it was somewhat a sad ending for the US but I am proud of the team. @Peter, the 100wr is a nice lens to add especially for the 1:1 macro in a good distance and I were you without a macro lens, I will go for the 100wr first unless you are more into landscape than macro. Thanks for the advice. My brother has a K10D and after further discussion I ended up ordering today: K-7, 18-55 WR kit, 50-200 WR kit, and Lowepro Slingshot 202. I do a lot of hiking and this seemed like a better balance and quality for the price. @Peter, my exact same thoughts here! Those ltd are the perfect reasons to go for Pentax, rather than any other brands. To hold the DA 15 Ltd is to love it. I never wanted one until I held it!